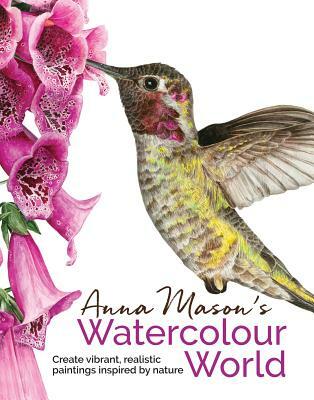 Anna's vibrant, detailed and uplifting watercolors have earned her worldwide recognition. In this, her second book, she goes beyond flowers to explore her inspirations from across the natural world, including fruit, birds and animals. The book gives you a very personal insight into Anna's way of working; with clarity and warmth she will help you find inspiration, choose scale and composition, see things correctly and work with discipline and flow until you produce fabulous work of your own. Anna Mason grew up surrounded by the lush English countryside and has always been inspired by the intricate detail and colorful beauty in the natural world. Completely self-taught, Anna has developed a true-to-life painting style that she wants to share with as many people as possible. It is her mission to get as many people enjoying the therapeutic benefits of watercolor painting as well as getting the kind of results they want. Anna won the Royal Horticultural Society's Gold Medal and Best in Show Award 2007; has paintings in the RHS Lindley Library Collection and also the Shirley Sherwood Collection; and was the Grand Prize Winner in International Artist Magazine for 'Strawberries Everest' 2011. She was elected to the Society of Botanical Artists 2013, and was a juror for the Denver Botanic Gardens and the Guild of Natural Science Illustrators (GNSI) exhibition 'Plants, Birds & Pollinators - Art Serving Science' 2013. She lives in Surrey and teaches at RHS Wisley & West Dean College.